Whether you’re looking for a dining spot for a special occasion or just want to kick your date night venues up a notch, there are several fantastic Charlotte restaurants to choose from. In addition, you can find most of these restaurants on this year’s Queen’s Feast: Charlotte Restaurant Week list. This year, Queen’s Feast celebrates 10 years of promoting the area’s thriving culinary scene. This year it runs from July 20 through July 29 and over 125 restaurants in nine counties will participate. In addition, select restaurants offer AAA Members an exclusive offer — purchase a $50 gift certificate from the restaurant for only $25! Although relatively new to Charlotte’s culinary landscape, Zeppelin has wasted no time appearing on locals’ “must eat here” lists. Zeppelin owners Jonathan Swope and Jonathan Tee were inspired by Thomas Edison’s time in the Queen City around the turn of the 20th century. Using harnessed electricity, Edison attempted to separate gold from low grade ore. While here, he also collaborated with Edward Dilworth Latta to build the Queen City’s first electric streetcar from South End to Dilworth around the turn of the century. The Charlotte restaurant design pays homage to that era with its industrial-meets-Victorian design elements. A large, lit model of a Zeppelin hangs above the dining room, oversized booths face the bar and TV screens play black and white movies featuring actors like William Powell, Buster Keaton and Myrna Loy. The booths are also an ideal spot to spy all the unique cocktail creations they serve. Wine is usually my go-to, and the number of wines they offer by the glass is really impressive. However, I couldn’t pass up trying out one of their craft cocktails, which are new twists on standard favorites. Why order an old fashioned when you can have the Uncle Eddy — wagyu fat washed bourbon, slow ginger syrup, buck spice bitters, king cube, candied ginger and cold smoked? No generic gin fizz here. Go for the Fogle Fizz — gin, yuzu-lemongrass cordial, butterfly pea flower syrup, sparkling water and dehydrated lemon. I have my eye on the Quit Dragon my Heart Around for my next visit. Zeppelin’s menu is as ambitious and creative as their cocktails. While the menu changes seasonally (and ingredients may even change from week to week), some customer favorites will remain year-round. We had sampled the coal roasted cabbage, which is wrapped in foil, buried in coals and roasted for two hours. 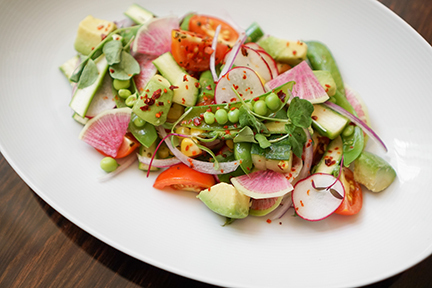 It rests on Arbequina olive oil, topped with charred scallion vinaigrette and served with hibiscus yogurt. The fried green tomato caprese was also fantastic — a double battered, locally sourced green tomato served with UAV burrata cheese from a Charlotte creamery. The scratch buns (with sweet miso heritage pork belly, shaved cabbage and pickled chilis) are also highly recommended. The buns are made fresh every day, and the dough is steamed to order, resulting in light and airy perfection. Save room for their Krispy Kreme bread pudding and thank me later. Located on the first floor of The Ritz-Carlton. Chef Matt Slezak is at the helm, creating unique plates that reflect both the American steakhouse traditions and modern Southern flavors. The atmosphere is upscale, yet comfortable. Guest attire runs the spectrum here. Whether you’re dining in your Sunday best or enjoying a meal in jeans, you’ll feel at home. They provide a very thorough wine list, but the craft cocktails caught our attention. The Nicolas Sage (Bacardi 8, plum bitters, lemon juice and sage both in the syrup and muddled) and The Burro (Herradura Silver, Cointreau, pineapple, lime juice, ginger beer, jalapeno and cilantro syrup) were both refreshing. We began our meal with the Charlotte restaurant’s famed fluffy popovers, which are made with gruyere cheese and served warm with butter and kosher salt. A copy of the recipe is placed on the breadboard, which is good because you’re going to want to eat these again and again. They specialize in exceptionally good steaks. 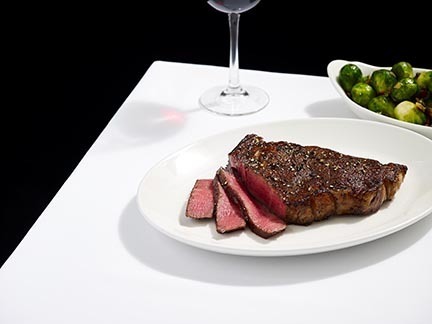 Their beef is certified Angus and they age it naturally, which makes it incredibly tender and flavorful. My husband raved about his filet. I wanted to sample everything, so I indulged in their abundant sides. The roasted beets salad was fresh and perfect. We also enjoyed the ricotta gnudi with smoked heirloom tomatoes and the Brussels sprouts. Our server was astute but not intrusive, and all his recommendations were on point. The courses were well paced, giving us the opportunity to enjoy the experience of a special meal together. Signature desserts like the crepe souffle with passion fruit sauce and the peanut butter chocolate mousse with banana ice cream are the perfect ending to an amazing dinner. For an incredible after-dinner cocktail experience, head up to The Punch Room. Situated on the 15th floor in The Ritz-Carlton, this glamorous, low-lit retreat exudes a speakeasy vibe that I’m a huge fan of. It’s an intimate escape (seats 37) with comfy couches, gold accents, plush high-back chairs, a marble-top bar and an Instagram-worthy city view. The hotel’s rooftop garden supplies fresh mint, jalapenos, rosemary and other herbs for craft cocktails they serve. It’s also home to two beehives maintained by Cloister Honey which provides honey for varied cocktails and small plates. We sat at the bar and observed bartender Geneviéve Bourgeois work her magic. 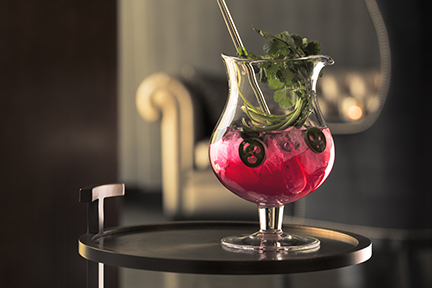 From spirits-driven punches to artisanal cocktails, The Punch Room’s drinks are inventive yet harmonious. Genevieve started us with the Fiesta Punch — tequila, jalapeno, cilantro, orange, lime and ginger kombucha provided locally from Lenny Boy Brewing Co. She asked us specific questions to determine our flavor preferences and suggested a cocktail accordingly. She was always spot on. Our other favorites included the Oaxacan Lavender Lemonade, the Carbonated Aviation and the Fennler on the Roof. Throughout the evening I realized that chatting with Geneviéve was like attending a mixology master class. Her knowledge of artisan cocktails is vast and she’s happy to share it. Although we were completely sated from dinner, we couldn’t pass up on sampling their beautifully crafted small plates. I urge you to try the lion’s mane mushrooms (with a vodka batter and green goddess dressing) and the cheese board. We also loved the English pea “explosion” with brioche, parmesan tendrils and lemon balm. My husband doesn’t even like peas and he snagged the last one before I could. Topping off our evening, we indulged in the assorted macarons — smartly presented on an artsy, acrylic stand created especially for the macarons. My tribe and I always celebrate our birthdays with a special meal out, and this is one of our frequent picks. The atmosphere here is elegant, but not stuffy — classic decor with elements of marble, dark woods and gold accents. 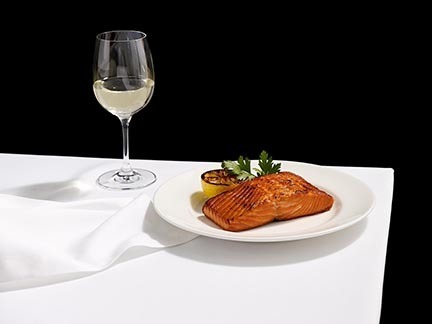 Whether it’s a birthday or anniversary card placed at your table before you arrive or accommodating varied diet preferences, the service at Del Frisco’s is stellar. If you’d prefer an intimate backdrop for a larger party, you can opt for a meal in the second-story mezzanine bar or their private wine cellar. The wine list is more than extensive, with more than 1,200 to choose from. Servers here are extremely helpful and well versed in choosing the perfect glass to go with your meal. Obviously, hand-cut steaks and chops are what most diners gravitate toward. However, seafood options like seared Chilean sea bass served with crab fried rice and a black bean garlic sauce or the pan-roasted chicken with oyster mushrooms, corn, fingerling potatoes and a roasted chicken jus are other menu standouts. They also offer a good selection of items for vegetarians — like asparagus with roasted almonds, uptown Del’s potato and heirloom tomatoes with burrata served with an aged balsamic reduction and pesto. All the sauces, salad dressings, breads and desserts are made in house and from scratch. I’m a huge crème brûlée snob, and they serve one of the best I’ve ever eaten. Another favorite birthday meal spot for me is this trendy multi-tiered spot in Uptown Charlotte. At the southeast corner of North Church Street and West 5th Street, the Charlotte restaurant is one of three 5Church locations (the others are in Atlanta and Charleston). The decor is trendy and whimsical with dramatic columns reaching to high blackboard ceilings accented with white chandeliers. Artist Jon Norris created the restaurant’s iconic Art of War art that adorns the ceiling. In fact, all 13 chapters of the book are painted in each of the three 5Church locations. The restaurant’s menu is as innovative as the design. 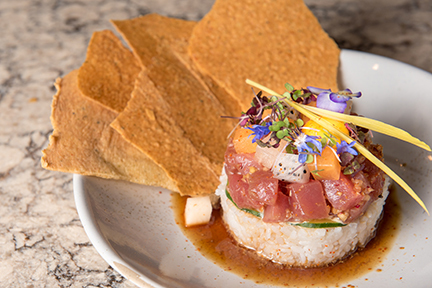 They’ve garnered many culinary accolades including most recently being voted “Best Restaurant” and “Best Chef” in the Charlotte Magazine Best of the Best Awards. Executive chef Jamie Lynch also competed in season 14 of Bravo’s Top Chef. 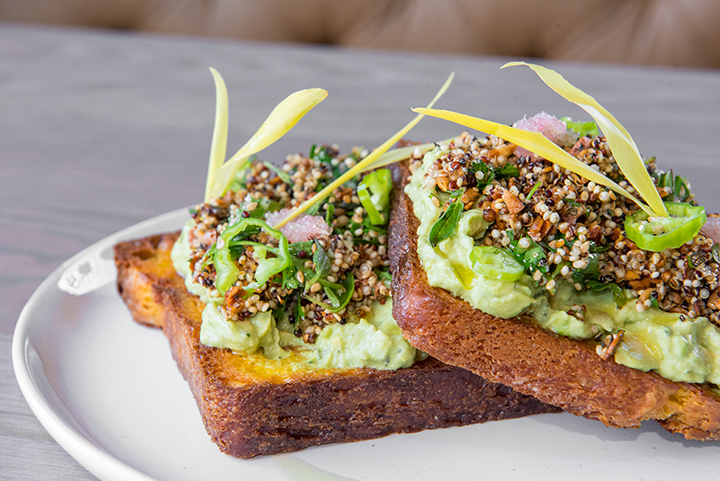 Menu standouts include their daily ceviche and buttermilk fried chicken. Sides are served family style. You can choose from braised collards, garlic parmesan broccolini and other options. On Friday and Saturday, they’re open until 2 a.m., so you can nosh on their wild mushroom flatbread, lamb burger or other snacks available on their late-night menu. If you aren’t a night owl, make reservations for lunch during the week or enjoy a leisurely weekend brunch. I was first introduced to this Charlotte restaurant during a Charlotte food tour and I’ve been plotting my return ever since. Seeing the venue alone is worth a visit, as the restaurant is located inside a renovated 110-year-old church in historic Dilworth. Their wine menu is extensive. They offer more than 300 wines and over 200 of them by the glass. I lean toward red blends, which don’t seem to be well represented on many restaurants’ wine lists I’ve seen. That’s definitely not the case here. For special occasions, you can book their Wine Cellar and let staff create a custom menu with perfect wine pairings. For dining options, you can sit at the bar and order from the full menu or from their smaller bar menu. Or, reserve a table in the dining room. It’s a good idea to call ahead as they sometimes close for charity events or private functions. Start with one of their salivary gland-inducing house made spreads. I recommend their pimento cheese with the braised leek and parmesan. You can’t go wrong with a sampling of their artisan cheese paired with locally sourced charcuterie. Entrees you should consider include their fried lobster tail, with a local N.C. honey-soy reduction and mustard aioli; the daily crafted chef’s vegetarian creation; or the dry aged 12-ounce ribeye. All the steaks are prepared on a cast iron skillet in a wood-fired brick oven, which creates a unique flavor and incredibly tender texture. Hungry now? Queen’s Feast is the perfect time to sample some of the above Charlotte restaurants (and more!). For a complete list of participating Queen’s Feast restaurants, visit their website.